Rene Descartes (1596-1650) had a remarkably short working life, and his output was small, yet his contributions to philosophy and science have endured to the present day. He is perhaps best known for his statement 'Cogito, ergo sum'. By a mixture of 'intuition' and 'deduction' Descartes derived from the 'cogito' principle first the existence of a material world. But Descartes did not intend the metaphysics to stand apart from his scientific work, which included important investigations into physics, mathematics, psychology, and optics. 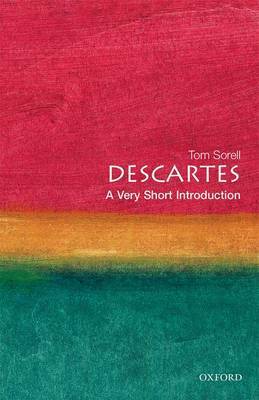 In this book Tom Sorrell shows that Descartes was, above all, an advocate and practitioner of a new mathematical approach to physics, and that he developed his metaphysics to support his programme in the sciences. ABOUT THE SERIES: The Very Short Introductions series from Oxford University Press contains hundreds of titles in almost every subject area. These pocket-sized books are the perfect way to get ahead in a new subject quickly. Our expert authors combine facts, analysis, perspective, new ideas, and enthusiasm to make interesting and challenging topics highly readable.